After a fun-filled three days in the Windy City, we were up at 6am to claim the car from the extortionately overpriced valet parking service. It was a Monday morning so our plan was to hit the motorway before the rush hour traffic started at 7.30am. After some tricky navigation through the roadwork chaos in central Chicago we escaped the city – on the opposite side, the inbound traffic was already building up. 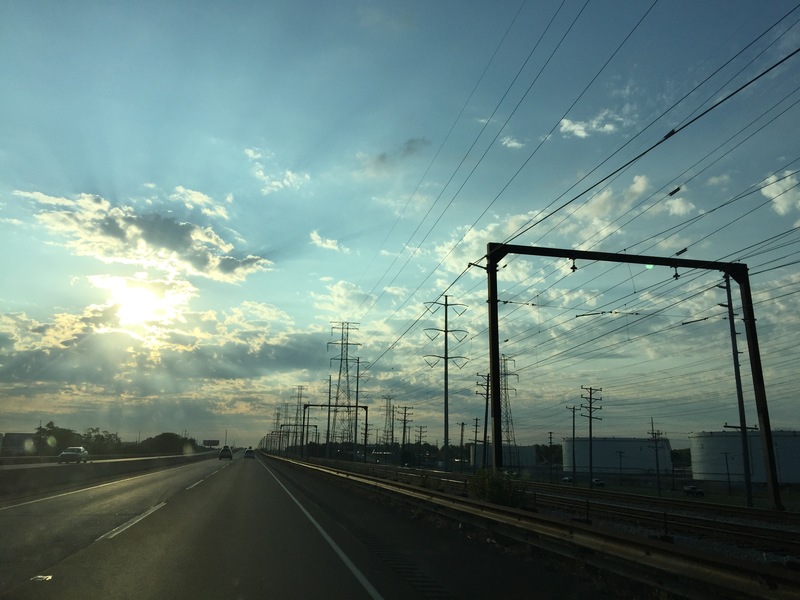 As we drove out of Illinois we stopped at several toll plazas – the few dollars seemed worth it to avoid the queues and drive on better roads. It was still shocking just how run down US roads and infrastructure are. From Illinois we crossed over into Indiana – driving passed massive factories pumping out smoke over small towns lining the highway. After a short stint in Indiana we headed north into Michigan along I-94 passing through Kalamazoo and Jackson en route to Detroit. Our original plan had been to spend the night in Detroit but we soon realised there was nothing to do there. We needed a driving break, so stopped at the abandoned Packard Plant – a iconic relic of Detroits industrial and automotive past. The surrounding neighbours are all extremely deprived – what was once a prosperous neighbourhood was now largely boarded up but looked like a gangland. We eventually found a small park where we could safely stop without attracting too much attention. 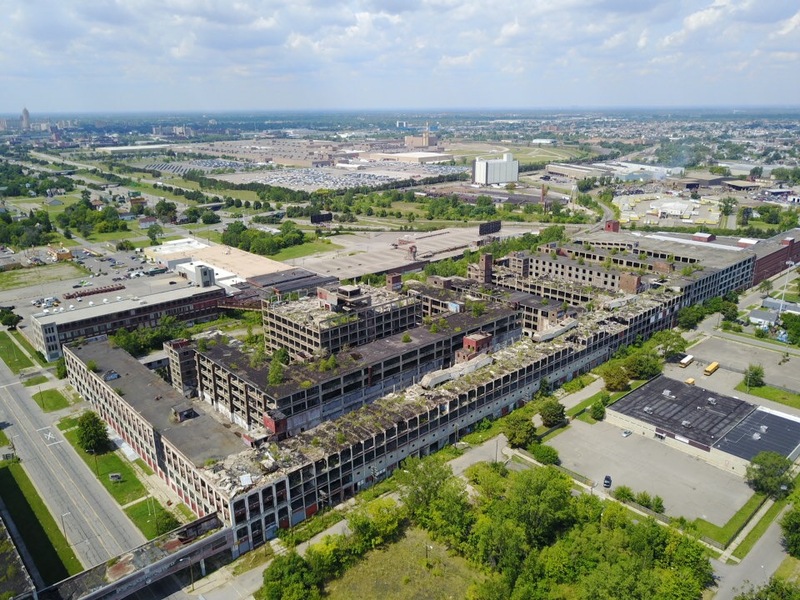 The run down Packard Plant buildings are in the early stages of being converted into housing but still in ruins, so we decided it would make a great drone photo so sent LARS exploring over the enormous site. From above we flew through the ruins, passed the old water tower and skybridge and along the old railway line. The scale of the building was impressive – it must have been spectacular in its day. With nothing else in Detroit of interest we decided to carry on across into Canada and give ourselves a head start for our trip the next day to Toronto. 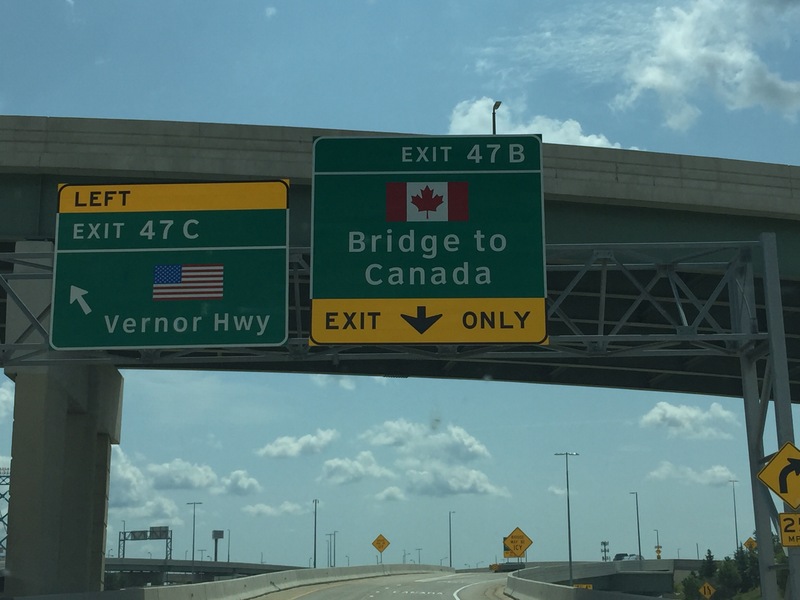 We’d heard the Ambassador Bridge border crossing was one of the busiest between the two North American neighbours but we drove across a completely empty bridge, straight up to an immigration lane and had crossed within five minutes. We found ourselves in the small Canadian town of Windsor – another deprived and unattractive town. We decided however to stay here for the evening to get some essential admin done, namely haircuts and laundry which were now critically overdue. We found a coin laundry in town and spent a productive two hours washing and drying every item of clothing we had. Rather than $3.50 per pair of boxer shorts that the hotel in Chicago charged – we spent just $6! With a boot full of clean clothes we headed to the local mall where stopped for a haircut and Taco Bell dinner. While my haircut was fine – Jamie’s got progressively shorter by the minute until the barber practically got the bic razor out and shaved him bald…. he also asked where we were from and when we said London he assumed it was the London, Ontario – a city a few hours up the road. After a productive afternoon we called it a night and had a relaxing evening at the motel – preparing for the next leg of our Canadian adventure. You guessed it – the next morning was another early start as we hit the 401 to Toronto. It was immediately apparent just how much better Canadian roads are than US ones – however Canadian driving and traffic is ten times worse – indicators are clearly optional extras. The drive was going smoothly until we entered Toronto and ground to snail pace for nearly an hour. Eventually we found our guest house and parked up in a small car park adorned with graffiti of the Taj Mahal and Machu Pichu – two of the highlights of our trip. After a quick shower and relax, our friend Ian we’d met on our travels in India came and picked us up for an afternoon of baseball and beer. Our first stop was a sports bar across the road from the Rogers Arena, under the shadow of the CN Tower – which was also our final ‘Wonder of the Modern World’. 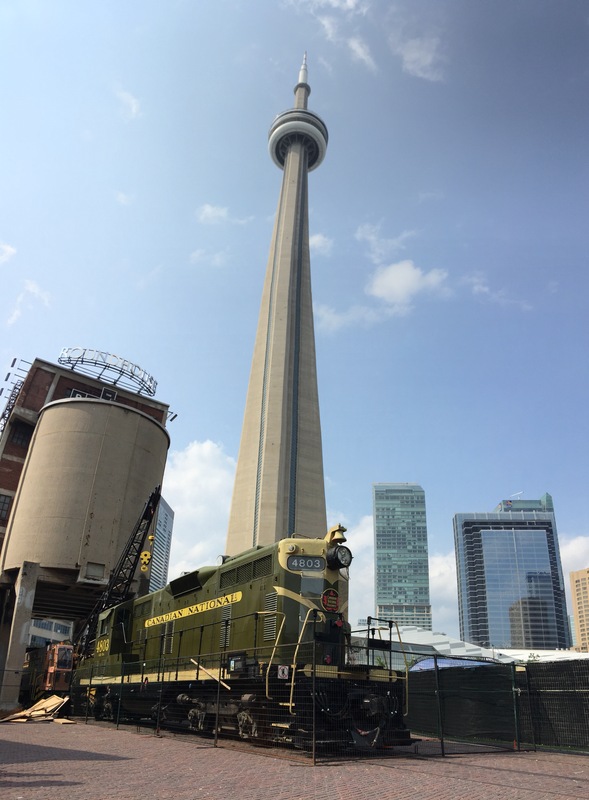 After a few beers and a snack we moved on to the Steam Whistle brewery where we enjoyed a couple more beers while we waited for Ian’s bro to arrive. With a full squad we headed the short walk across the road the stadium. Jamie stopped at one of the local merchandise stores and bought himself a Blue Jays baseball cap, while the rest of us headed inside to buy more beers. Ian had scored some awesome seats behind the batter with the players families, giving us a great view of the game. With beer and hot dogs in hand, the game flew by. 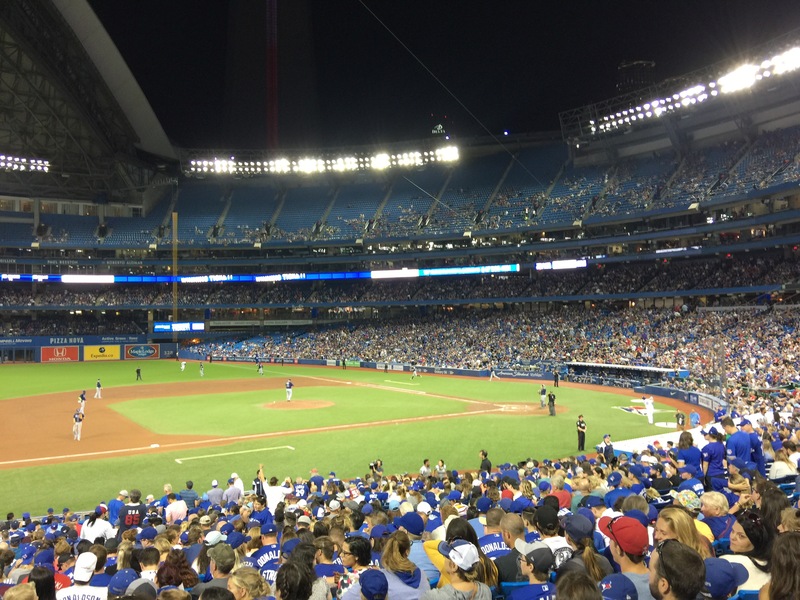 At one point the Blue Jays were 6-1 down to Tampa but a triple score around the 7th game brought the game back to 6-4. Jamie opted for soft drinks as he was driving the next morning, while the rest of us continued with a few more rounds of beers. These helped soften the defeat as the comeback was short lived and the game fizzled out with the Jays losing 6-4. The eleven or so pints was more than enough for one night so we said our goodbyes and got an Uber back to our hotel.